There is nothing quite like a visit to the Chelsea Flower Show to galvanise one into action vis-à-vis one’s own garden. I returned home on Tuesday night brimming with ideas but with an ominous stuffed-up feeling. I assumed this was related to the notorious Chelsea cough, only to find that by Wednesday morning I had developed a full-blown cold. Two days of self-enforced quarantine gave me time to knock out five Chelsea posts and one for the NGS, and by this morning I had regained sufficient vim and vigour to get back outside where I belong. Before I could put all my Chelsea-inspired plans into action I had to visit the dentist and hygienist. Try as I may, I never get my ‘daily routine’ quite right. This time I’m guilty of brushing too hard and eating too many processed foods, which is apparently what causes the ulcers I’ve been prone to since I was a child. I listened to the advice, smiled, took it with a pinch of salt and went to Boots where I purchased some interdental thingies (which I’ll probably never use) before proceeding straight to my local garden centre. I already have a grand plan for the Gin & Tonic Garden but it will be a few years before this can be realised. In the meantime I am trying to create myself a happy, flower-filled space with a vaguely yellow and purple theme. My palette has already been polluted by a deep red rose, which is the only plant in the garden that the previous owner had planted. Since he’s no longer with us, I feel it’s my duty to keep it going in his memory. It’s a healthy, vigorous, nameless rose, but the flowers have no scent, which is criminal. Truth be told I have a few other red-flowered plants, including Cestrum fasiculatum ‘Newellii’ and a rogue tree peony which was labelled as being yellow and flouncy but has annoyingly turned out to be burgundy and ordinary. At the garden centre I succumbed to yet more plants, when what I should have been doing is dealing with the ones I already have. I purchased armfuls of an osteospermum that has canary-yellow flowers with a plummy eye. It is optimistically called ‘Blue-Eyed Beauty’ (see above for evidence of lack of blue). Then my eyes alighted on Magnolia ‘Daphne’, which I have been coveting for some time. It is a small tree with properly yellow flowers which appear at the same time as new foliage – lemon and lime all at once. Dear Reader, I bought it (roll eyes, throw hands in air). I know this was probably wrong of me, but it’s a small magnolia, the flowers are the correct colour for my garden, and it was there … begging to be given a good home. Who was I to refuse? I immediately planted it in the largest terracotta pot I had to hand and eventually I will plant it in the ground where it belongs. My carpenter paid a visit at midday and frowned a great deal when I explained my plans for replacing the fencing around the Gin & Tonic Garden. I took this to mean a) it was going to be a lot of work and b) I probably couldn’t afford it, so this project may have to wait until next year. Since my standards tend to be elevated to unrealistic levels following Chelsea, there is no harm in him managing them down gently. As with the dentist, I smiled and nodded politely whilst I took the frowns on board. In the meantime he’s starting the restoration of the outdoor kitchen and garage doors next week, both of which are jobs I’ve put off for too long and which need completing before I open the garden in August. The joy of having the Gin & Tonic Garden as well as my original garden is that I can grow sun worshippers again. 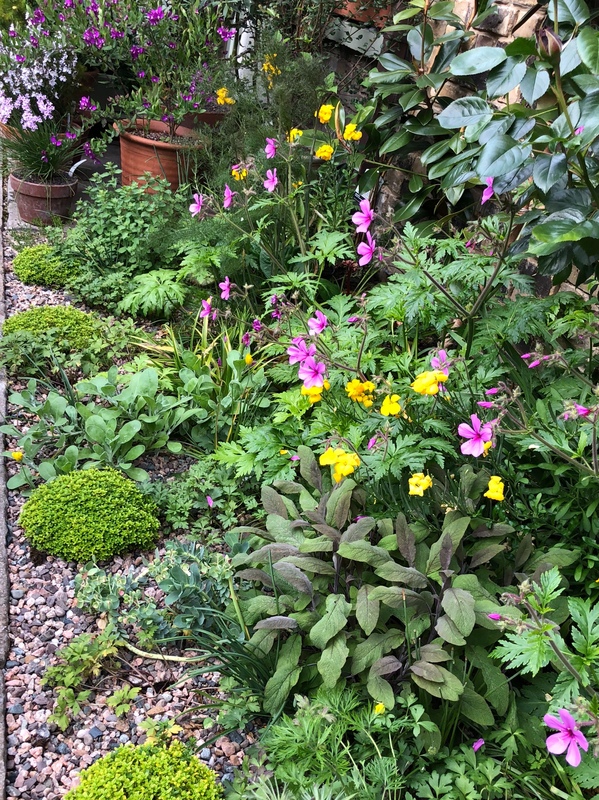 The little south-facing corner created where the library meets the garden room is a sheltered sun trap, perfect for growing some of my tender plants. I change the grouping regularly so that it’s always looking fresh. 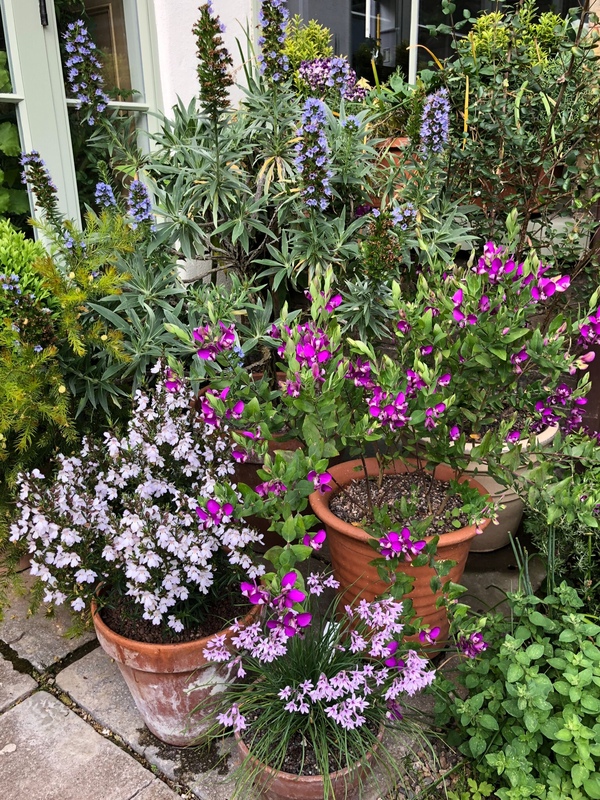 Currently I have Echium candicans (behind me as I write and still covered with bees), Polygala myrtifolia, Tulbaghia ‘Purple Eye’ and Prostanthera ‘Poorlinda Ballerina’. All are going great guns and helping me through that odd period between the tulips fading and the summer flowers gathering steam. Geranium palmatum, which I was so pleased to see shown on the Todd’s Botanics exhibit at Chelsea, is also starting to bloom, sending long stems of pink flowers out over the gravel patch. Somehow everything seems to be turning a corner this week after the harsh winter and spring. Even those plants that were cut to the ground, including Fuchsia arborescens, Hedychium ‘Tara’, Melianthus major and Agapanthus africanus, are showing the first signs of recovery. Warm, muggy weather over the Bank Holiday will see them progress even further. 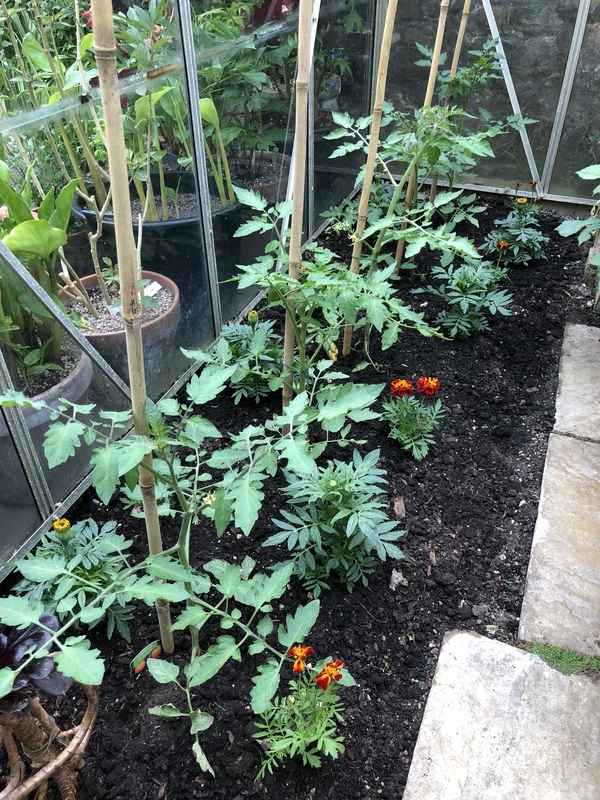 In the greenhouse, the tomato plants I put in only a fortnight ago are producing their first trusses of flowers and looking very healthy indeed. 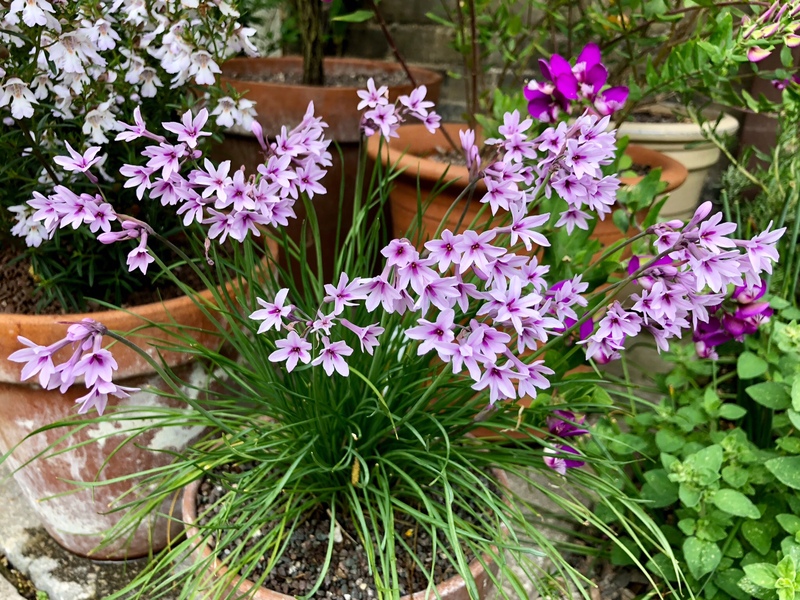 Although I remain without lupins, rammed-earth walls, a swanky new greenhouse or a showpiece sculpture, Chelsea compels me to try new things and set my standards higher. Whilst I will never be able to exercise the restraint of a show garden designer, I can still garden better. In the end that’s what Chelsea is all about; encouraging gardeners, nurserymen and designers to up their game and reach for the stars. TFG. Your garden is looking a gorgeous froth of colour, Dan. 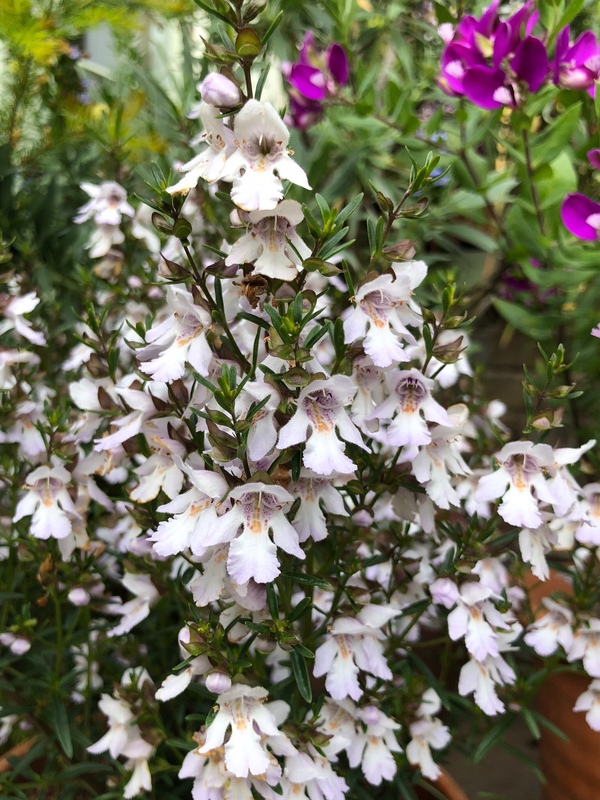 That prostanthera is a good doer, isn’t it? I have it in my garden and it flowers its socks off. I like that osteospermum very much- have never seen one so colourful. The Osteospermum’s super isn’t it? I hope it flowers well. I find osteospermums tend to stop start quite a lot. Maybe temperature related. I love the prostanthera. My other one is ‘Blushing Bride’ and is recovering from looking quite sickly after the winter. My Sophora however has come back from the dead and is a picture of health. Interested to see your mention of Tulbaghia, Dan. I bought a couple of plants in flower last summer because they were so pretty, but have had to jettison them because I couldn’t stand their raw turnip smell in my small garden! Does anybody else feel the same? Oh really? Surely only if crushed? I do live in an area where cauliflowers and cabbages are the main crop, so perhaps I am immune to that smell! Your garden is looking so beautiful. One of the silver-linings of a cold winter and cold early spring (we had that too here on the west coast of Canada) is how the compressed awakening is so lush and colourful. At least that’s what I’m telling myself lol! I loved your coverage of Chelsea and did notice all the lupins! 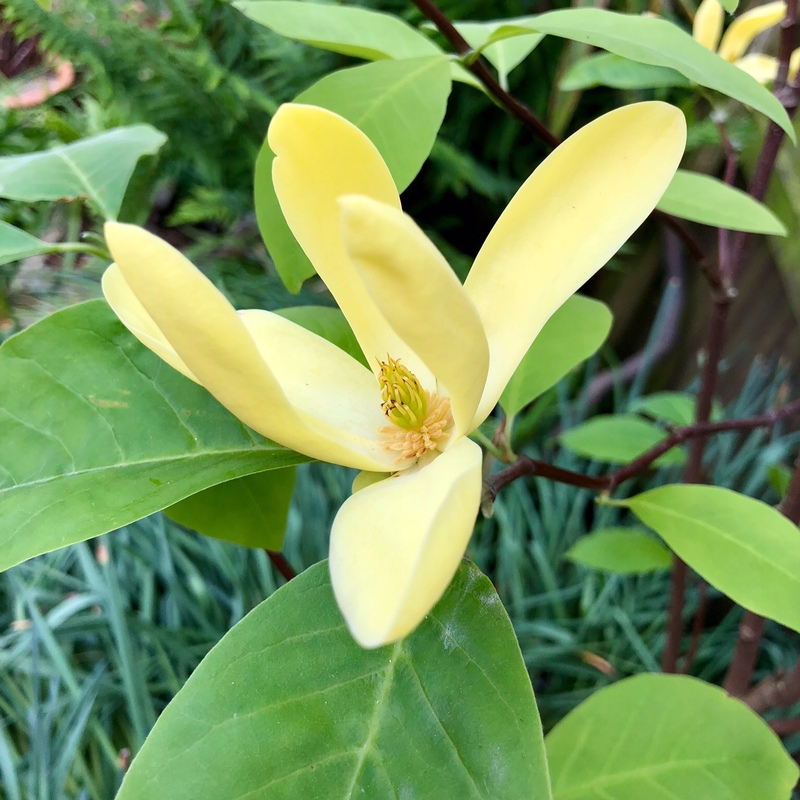 I have a small yellow magnolia too, and it’s still in a pot after two years because I’m wanting to plant it in a spot where it’s loveliness will be accentuated, but I’m uncertain where that might be. It’s a pale creamy yellow with a very faint blush of pink. Also, I have a bed of pale yellow bearded iris that need some partners. What do you like with the pale yellows? Silvers, greys and lilacs, definitely with pale yellows. They are so pretty together. Or you could try soft apricots and peaches. So delightful is your little Gin & Tonic garden room that I want to invite myself to tea! Unfortunately, my new friend, you’re over there and I’m over here with an ocean and a continent apart. 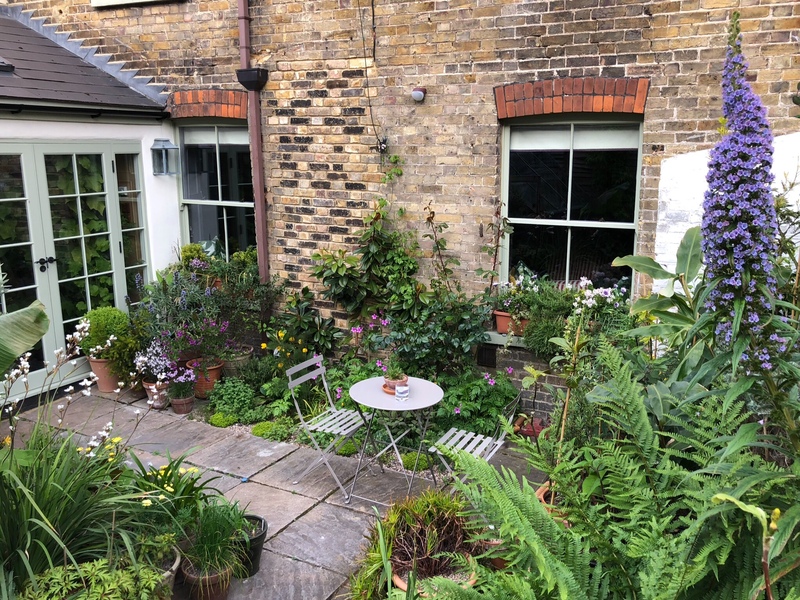 My courtyard, however, becomes a garden room with additional urns of ferns (doesn’t that sound silly) and terra cotta pots of geraniums and petunias with lots of fillers. Now, what is that gorgeous tall blue thing on the right side of your second photo, beneath the shot of your new yellow magnolia? No, I did NOT roll my eyes when you said you succumbed to the latter. I would have, too. It reminds me of my Daddy’s magnolia fuscata in the South. As little girls, my sister and I used to collect the unopened buds as “bananas” for our dolls’ tea. The blue flowering stalk is too thick to be a foxglove, or is it?. Ahh yes, now I have pink also in the form of Geranium palmatum. All colours are welcome in my garden. I don’t have the heart to edit too rigorously. I am not attempting to win any medals! The stars are in your creative writing and photos. I hate to disagree, but I know it as Echium pininana, the tree echium. The distinction is that E. pininana produces a single, very tall spike up to 12ft tall which flowers pretty much from April until October here in the UK. E. candicans is a shrubby plant with silvery leaves and multiple flowering stems that last less long. The confusion is that both may be called pride of Madeira, although this seems to be used more often for E. candicans. So glad you are feeling better! And thank you SO much for your fantastic posts about Chelsea. Totally agree with Frog that the Beeb’s coverage paled in comparison!!! Here’s to a great weekend for gardeners everywhere! Thank you Jean. I didn’t have time to watch most of the BBC coverage but what I did see I thought was disappointing. Useful if you just wanted some pointers about what to see but it all seemed very superficial. My limit was reached when Mary Portas came on. She gets everywhere and had nothing useful to say at all. Hey ho. I was wondering where you found the time to do such a brilliant coverage of Chelsea, I am waiting for the rain to start then I can spend ages going through them thoroughly, much better than the TV coverage, and a delight to look forward to. Glad the cold is better but please look after your teeth, it will be important when you get to my age! Advice please, I always struggle with osteospermums in pots, I use a multiputpose compost and add grit but they never seem to thrive. Your plants are as ever all looking wonderful and do keep the rose, I love the occasional different highlight in a garden. The rose will remain as long as it’s healthy. I don’t have the heart to dig it out, but I may cut more of the flowers as they tend to weigh the stems down. Funny thing, it wouldn’t get an AGM from me! As I have previously said, but will again, thank you for your comprehensive covering of the Chelsea gardens. I get frustrated with the Beeb’d coverage. Why do we need to talk to ‘celebrities’ who most of the time don’t even have a garden or if do, employ a gardener. Rather tell me which Astrantia like shade and which ones don’t grow too tall. Pfft….!! Enjoy your weekend 🙂 And I DO like your pretty magnolia. My Cornish grandmother had the hardy osteospermums which created low mounds of foliage and had elegant flowers on long wiry stems. Those qualities seem to have disappeared from the newer varieties. I guess we have exciting colours instead and I do like these yellow ones … in fact anything yellow at the moment. I couldn’t watch most of the BBC coverage but those snippets I did see varied between ingratiating and superficial. I used to relish every moment but now I don’t care if I miss it. The main advantage is that the cameras get angles that visitors can’t, and that it brilliant for the viewer at home. I have bought three tiny new osteospermums that are supposedly the hardy type. We shall see. And I shall look out for the Prosterantha. But you have a lovely garden. I enjoyed looking at the photos. Thank you Arlene. It can and will be more lovely. It does not really come into its own until July. Between now and then I just pretty it up with annuals. I might squeeze a couple of cucumbers in when the aeoniums come out and go in the garden. A zucchini would take over and I’d never get through the greenhouse door! What a really lovely Post Dan. I’m a garden designer (ex UK but now based in Far North Queensland Australia) and expected to be inspired by Chelsea and came away feeling a little overwhelmed and exhausted by all that talent and energy and wishing that I could do something just as wonderful for my clients and particularly my own garden. Your article feels like it was written just for me. 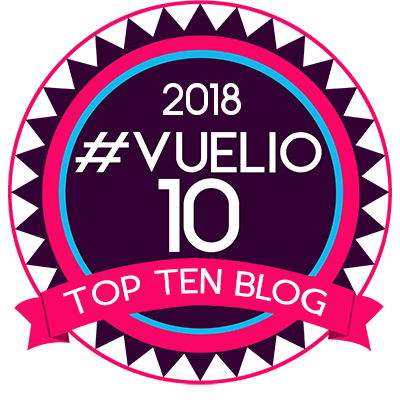 Everyone thinks it would be wonderful to be a garden designer with queues of projects and the ability to do fantastic things for those who have great budgets but there is a constant feeling of never achieving your goals of perfection. You put it into perspective – I’m going back to be a better gardener with the restrictions of our climate and the challenges of the insects and creepy bitey things that can make gardening a not so pleasant experience although the effect from a distance is quite spectacular. No regrets over that Magnolia Dan. What a corker. I have no bare earth and still would have snaffled her. Lovely, lovely, lovely! Can’t wait to see it! Thanks for the peek into your greenhouse too. I don’t mind the smell of Tulbaghia. A bit foxy. A bit garlicky. It is strong, no doubt. Not Turnip though. I love your pale yellow magnolia – I roll my eyes and wish it was mine. PS Thanks for the Chelsea posts and your personal comments.